Check out our Bug Extermination Report for a list of resolved issues! During his battle with the Black Mage, Luminous along with the other Heroes, managed to seal him away. But not before the Black Mage could impart some of his darkness on to Luminous. Luminous must now learn to control the awesomely terrifying power of the Black Mage before it threatens to consume his soul and plunge him into the world of darkness. Good thing Luminous will have some help on his journey! His trusted (and see-thru) helper, Vieren, and the first person he met after fighting the Black Mage, Laina. With the help of Vieren and Laina, will Luminous learn to wield the powers of both Light and Dark to defend Maple World before it is too late? The Global MapleStory version of Luminous is a bit different from the version of Luminous in the Korean version of MapleStory. In this version, the quests and skills have been modified to adjust gameplay flow. You won’t choose between light/dark in the beginning tutorial, and there will only be one story. The story will be based on the Dark side, wherein Luminous is conflicted about the darkness within him. You will have access to light and dark skills, with the ability to switch between the two and activate buffs that will enhance one or the other attribute. You will gain the light vs. dark gauge when you complete your 2nd job advancement, at which point you will also be able to switch between light and dark modes. When switching between light and dark modes, you’ll briefly enter an Equilibrium state. Power Stance has a chance to be activated for a brief period, preventing you from getting knocked back. Attacking monsters with light skills will recover 1% of your HP. Dark skills will use 0 MP. 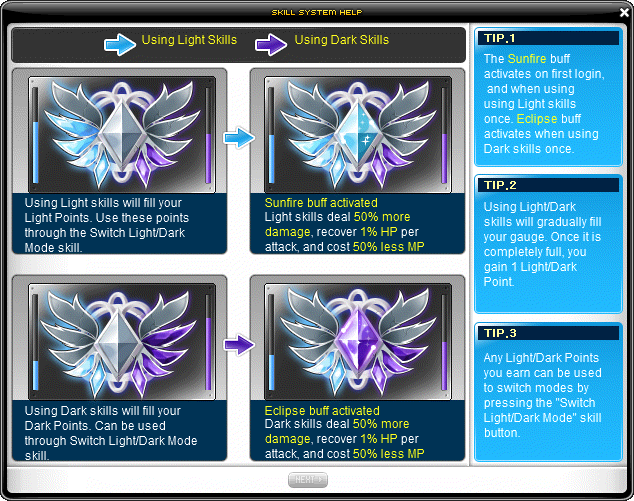 Both effects for light and dark will be applied for attack skills that have an equilibrium attribute. Flash Blink – Luminous turns into light to track enemies. The player can teleport to a random place when Luminous uses this skill in a town without monsters. Inner Light – Passive Effect: Luminous is a strong willed individual with great insight. Luminous is permanently immune to Darkness status effect. In addition, Luminous’s MP increase at level ups are increased. Raises your Willpower, Insight, and INT. Light Wash – Passive Effect: 10% of enemy DEF is ignored when you attack. You can eventually share this ability with one of your other characters in the same world. Eclipse (obtained at 2nd job advancement) – While Eclipse is active, you deal 50% more damage with Dark Magic attacks and they cost 50% less MP. Use Dark Magic attacks to charge Eclipse. Cannot be applied at the same time as Sunfire or Equilibrium. Sunfire (obtained at 2nd job advancement) – While Sunfire is active, you deal 50% more damage with Light Magic attacks and they cost 50% less MP and recovers 1% of HP. Use Light Magic attacks to charge Sunfire. Cannot be applied at the same time as Eclipse or Equilibrium. Equilibrium (obtained at 3rd job advancement) – While Equilibrium is active, you will receive 1% HP per cast, 100% Bonus Damage and no cooldowns for 10 seconds. This allows you to use your most powerful spells for that duration. Cannot be applied at the same time as Eclipse or Sunfire. Flash Shower – [Light Magic] Fires a condensed orb of light. At Master Level: Damage: 280%, Max Enemies Hit: 5, hits multiple times if Sunfire is active, MP Cost: 18, Master Level: 10. Abyssal Drop – [Dark Magic] Drops a condensed orb of darkness on multiple enemies in front of you. At Master level: Damage: 107%, Max Enemies Hit: 6, hits multiple times (more when Eclipse is active), MP Cost: 19, Master Level: 10. Light Speed – Teleport in the direction you want. You will be invulnerable for a short time after teleporting. Passive Effect: Increases Movement Speed by 20 and Jump by 10, MP Cost: 20, Master Level: 10. Standard Magic Guard – Passive buff. Converts a portion of damage received to MP instead of HP. At Master Level: 85% of damage affects MP instead of HP. If your MP reaches 0, your HP receives full damage. Master Level: 10. Mana Well – Increases Max MP for a short time. At Master Level: Duration: 180 secs, MP +30, Can stack with other buffs. Master Level: 20. Dark Affinity – Permanently increases light and dark Magic ATT. At Master Level: Increase light and dark magic ATT by 5%. Sylvan Lance – [Light Magic] Tosses a spear of light to hit multiple enemies. At Master Level: Damage: 180%, Number of Attacks: 4, Max Enemies Hit: 8, MP Cost: 31. Master Level: 20. Blinding Pillar – [Light Magic] Detonates a pillar of light that knocks back enemies and has a chance to stun. At Master Level: Knockback Chance: 100%, Distance: 350, Max Enemies Hit: 10, MP Cost: 15, Master Level: 10. Pressure Void – [Dark Magic] Direct an orb of darkness to batter enemies. You can move the orb by holding the skill key and steering with the directional keys. At Master Level: Damage 168%, Max Enemies Hit: 8, Maximum Range: 350 to right and left of character, MP Cost: 15, Master Level: 20. Black Blessing – A dark orb forms when you evade attacks for a short time in battle. Accumulating orbs will also increase Magic ATT. If you take damage, one orb will be destroyed and absorb some of the damage. At Master Level: 1 Orb: 50% increase in Magic ATT, 2 Orbs: 30% increase in Magic ATT, 3 Orbs: 20% increase in Magic ATT, Master Level: 20. Magic Booster – Increase the attack speed of your weapon. Must have Katara equipped. At Master Level: Attack Speed +2 for 180 secs. Master Level: 10. Spell Mastery – Magic Mastery and Magic ATT increase. At Master Level: Magic Mastery :50%, Magic ATT: +10. Mastery Level: 10. High Wisdom – Permanently increases INT. At Master Level: Increase INT by 40, Mastery Level: 5. Spectral Light – [Light Magic] Fires controllable beams of light. You can steer the beams by holding the skill button and using the directional keys. At Master Level: Damage: 340%, Max Enemies Hit: 8, Number of Attacks: 4, Master Level: 20. Ray of Redemption – [Light Magic] Heal your party members and deal damage to enemies with the power of light. At Master Level: 6 enemies within range Damage: 180%, Recovery: 800%, Master Level: 20. Moonlight Spear – [Dark Magic] Fires a chain of dark moonlight from under the enemies’ feet. At Master Level: Damage: 361%, Max enemies hit: 6, Number of Attacks: 2, MP Cost: 75, Master Level: 20. Death Scythe – [Equilibrium] A scythe-toting reaper comes down to destroy enemies. At Master Level: Damage: 230%, Number of Attacks – 6, Max enemies hit: 10, MP Cost: 120, Cooldown: 24 secs, Master Level: 20. Shadow Shell – Deflect all abnormal status effects. The shell breaks and must cooldown after a certain number of deflected status effects. Passively increases resistance to all elemental and abnormal status effects. At Master level: Ignore abnormal status 3 times, Cooldown: 300 secs when broken. Passive effect: Increase resistance to all elemental and abnormal status effects by 40%, Master Level: 10. Dusk Guard – Temporarily increase Physical and Magic DEF and has a chance to ignore damage. At Master Level: Duration: 180 secs, Weapon/Magic DEF: +300, 20% chance to ignore damage, MP Cost: 76, Master Level: 10. Photic Meditation – Temporarily increases party Magic ATT. Stacks with Meditation. At Master Level: Duration: 180 secs, MP Cost: 55, Increases Party Magic ATT: 40. Master Level: 20. Lunar Tide – Increase either Critical Rate or ATT, depending on your HP and MP. At Master Level: When MP is greater than HP, damage increases by 20%. When MP is lower than HP, Critical Rate increases by 30%. Master Level: 20. Reflection – [Light Magic] Emit a powerful arrow of light that splits when it hits enemies to deal splash damage. At Master Level: Damage: 420%, Number of Attacks: 4, Max enemies hit: 8, MP Cost: 81. Master Level: 30. Requires Mastery Books to obtain max level. Morning Star – [Dark Magic] Drops explosive meteors on enemies. At Master Level: Explosion Damage: 370%, Knockback Damage: 180%, Max enemies hit: 8, MP Cost 50, Cooldown: 5 secs. Master Level: 30. Requires Mastery Books to obtain max level. Apocalypse – [Dark Magic] Opens the Abyssal Rift under enemies to flood them with void energy. At Master Level: Damage: 350%, Max enemies hit: 8, MP Cost: 100. Master Level: 30. Requires Mastery Books to obtain max level. Ender – [Equilibrium] Attacks enemies with a giant blade that instantly eliminates them. Deals great damage to monsters that do not fall instantly. At Master Level: Max Instant KO’s: 2, For enemies that cannot be instant KO’d: Damage: 333%, Number of Attacks: 7, every attack will be critical. Cooldown: 12 secs. Master Level: 30. Requires Mastery Books to obtain max level. Dark Crescendo – Has a chance to increase damage with each consecutive hit for a short period of time. At Master level: For 180 secs, chance to increase Damage with each hit: 80%, Damage 1%, can stack up to 30 times. MP Cost: 80. Master Level: 30. Requires Mastery Books to obtain max level. Arcane Pitch – Ignore DEF and increase Critical Rate for a short period of time. At Master Level: Duration 180 secs, Ignore DEF: 100%. MP Cost: 85. Master Level: 30. Requires Mastery Books to obtain max level. Magic Mastery – Magic Mastery and Magic ATT increase. At Master Level: Mastery: +70%, Magic ATT: +30, Minimum Critical Damage: +15, Mastery Level: 30. Requires Mastery Books to obtain max level. Maple Warrior – Temporarily increases the stats of all team members. At Mastery Level: All Stats: +15, Duration: 900 secs, MP Cost: 70. Mastery Level: 30. Requires Mastery Books to obtain max level. Click the giftbox notifier on the left-hand side of the game window to receive a free Character Slot Expansion Coupon. Only 1 Character Slot Expansion Coupon can be redeemed per account. You won’t be able to use it in a world where you’ve reached the maximum of 18 character slots. Quests and buffs and items and experience. The most famous MapleStory Christmas of all? That’s right, Happyville is back! This year we have several Holiday themed events. Talk to Rooney to visit Happyville. Rooney is in most towns. Talk to Rupi in Happyville to return to the town you came from. Christmas trees (you can purchase ornaments from Rudi), and get memorable screenshots! Talk to Cliff in Happyville to begin this quest. Collect Rascal Snowpieces from monsters and return them to Cliff. Reward: 3x Cliff’s Special Potion: Turns the player into a pet or monster if consumed. Once transformed, you can enter the fireplace of the house behind Cliff to visit Santa’s Shop! Note: Once you get to Santa’s Shop, you can use Rascal Snowpieces to purchase some fun items, so be sure to save them up! Requires: Lv 13 or above. Speak with Torr in Happyville to begin this quest. Purchase 1 Torr’s Antlers from the Cash Shop (only costs 1 meso!) and give them to Torr. Requires: Lv 23 or above. Speak with Simon in Happyville to enter Shalom Temple to begin this quest. Help Hannah and Simon prepare for the Festival of Lights by completing various quests for them. Collect 25 Altar Pieces from Dark Axe Stumps and Axe Stumps and bring them to Hannah. Reward: Gelt Chocolate x2: 100 HP/MP, +120 DEF/M.DEF, +30 ACC/AVD, +10 Speed/Jump. Duration: 10 minutes. Collect 9 Sabbath Candle from Horny Mushrooms and bring them to Hannah. Talk to Hannah after completing Blessing the Festival and receiving the Hanukkah Present. : Has a chance to add an upgrade slot to your item if you have any hammer slots available. A hammer slot will be used up even if this item fails. Untradeable. Requires: Lv 25 or above. Talk to Paperboy (located in most towns) to begin the quest [News Special Report]. Help Rooney in Happyville find out what’s happened to Santa! Requirement: News Special Report completed. Collect Santa Encyclopedia Vol. 1 – 6 from monster drops or from Happyville quests. Have Santa Encyclopedia Vol. 2 in your inventory. Talk to Mrs. Claus in Happyville. Requirement: Santa Grandmother Finding completed. Have Santa Encyclopedia Vol. 1 in your inventory. Requirement: Common Sense of Santa completed. Collect Santa’s Encyclopedia Vol. 3. Requirement: Socks Creation Recipes completed. Receive and double-click the sock frame. Apply 30 qualified knitting balls from Noonoo then drop them in the sock frame to create socks. Talk to the Christmas Tree with Santas Encyclopedia 4 in your inventory. Cliff’s Rudolph – Cliff’s Request. Cliff’s Rudolph – Torr’s Whereabouts. Helping to Clean Chimney – Santa Cat’s request. Helping to Clean Chimney – Delivery of Rina cleaning device. To Sleep Icarus – Warm Milk Delivery. To Sleep Icarus – Delivery the word Thank . Requirement: Socks Hanging in progress. Hit the camera with normal attack and obtain dropped picture. Talk to Torr and let him know Cliff is looking for him. Reward: EXP, recommendation letter, Fame. When you accept that you will bring a Chimney Broom and a Flashlight from Rina in Henesys, the quest will move on to Delivery of Rina cleaning device. Requirement: Maple Claws’ request completed. Talk to Rina in Henesys. Obtain a Chimney Broom and a Flashlight from Rina and deliver them to Maple Claws. Requirement: To sleep Icarus completed. Talk to Roodolph in Happyville. How to end: Buy milk from the general store in Kerning City and deliver it to Icarus. Requirement: Warm Milk Delivery completed. Talk to Icarus and deliver the warm milk. After delivering milk to Icarus, talk to Roodolph. Rewards: recommendation letter, Fame, EXP. Among multiple players within the same channel, increase the Fame of a particular player chosen by Bicho, and then go back and talk to Bicho. Requires: Lv 10 or above. Accept the quest from the star notifier on the left-hand side of the game window. Randomly contains 1 of the following: Tempest Coins, Polar Bear Chair, Christmas Snow Fur Lump Cape, Scrolls for Christmas Snow Fur Lump Cape, Christmas title, Stocking Pot, Reindeer Milk (10), Sunrise Dew (10) or 1.5x EXP Card. Collect 100 Jolly Stamps from monsters no more than 11 levels lower or 21 levels higher than you to exchange for 1 Tempest Coin. Complete the quest by hanging empty Christmas Stockings in your Item Pot (Y) and “feeding” it ETC items until it is full. You receive 1 from Cassandra at the start of the quest, but others will drop from monsters. Randomly contains 1 of the following: Tempest Coin, Rudolph’s Red Nose Bandage, Santa Sled Mount 7-Day Coupon, Rudolph’s Red Nose (14 Days), Snowball (10), Reindeer Milk (10), Sunrise Dew (10) or 1.5x Drop Card. Get the Rudolph’s Shiny Nose Box!! Click the Snowman, Small Snowman, Rudolph or Christmas Sock objects in or near towns, and Rudolph’s Shining Box will drop. Randomly contains 1 of the following: Tempest Coin, Reindeer Milk (10), Sunrise Dew (10), Melting Cheese (10), Snowball (10), or 1 of 6 trait items. Requirement: Luminous, Lv 50 or above. Accept the quest through the event notifier on the left of the game window. Reward: Luminous Ring – REQ LVL 50, STR/DEX/INT/LUK +3, Weapon/Magic ATT +2, Weapon/Magic DEF +10, Accuracy +10. When your job is Luminous(3) or Luminous(4) Magic ATT +5. You can use a Sharing Tag to move it once within your account and in the same world via the storage system. Requirement: Luminous, Lv 70 or above. Luminous can obtain untradeable Special Mastery Books upon reaching Lv 70. Accept the quest through the event notifier on the left side of the game window. The books are as follows. All of them have 100% chance to raise the Master Level of their corresponding skills. Requirement: Luminous, Lv.30 to 79. Accept the quests through the event notifier on the left side of the game window. This quest can be repeated on levels 30, 50, 60 and 70. You will receive a reward based on your level. You cannot receive the reward for a lower level after 10 level ups, so make sure to collect your rewards while you can! For example, you cannot collect the Lv.30 reward once you reach Lv. 40. Reward: Lv 30, 50, 60 or 70 Equipment Box, filled with untradeable equips for Luminous, appropriate to the level at which the box was collected. Requirement: Luminous, Lv 50 to 100. This quest can be repeated every time you go up 5 levels, between Level 50 to 100. You cannot receive the reward for a lower level after you level up, so make sure to collect your rewards while you can! For example, you cannot collect the Lv.60 reward once you reach Lv. 61. Reward: 1.5X EXP Coupon – Receive a 1.5x EXP buff for 1 hour. When it is winter in the Northern Hemisphere, it is summer in the Southern Hemisphere. Because of this, Cassandra decided to pack up a bunch of ice chests with some summer goodies. But some monsters came and stole the ice chests from her before she could give them out. Collect ice chests from any monsters you kill (most monsters drop them), and Cassandra will let you keep the contents for yourself! Vendors Gale and Spark have made appearances in most towns to exchange their wares for Tempest Coins. The Tempest Coin Shops can also be accessed via the Quick Move button in towns. Some items can only be purchased a limited number of times per character. Requires: Lv. 10 and above. Talk to Cassandra or click the Tempest event notifier on the left-hand side of the game window to accept this quest. Defeat 200 monsters that are 11 levels lower or 21 levels above your level. Repeatable after 10 minutes, to a max of 10 times a day. Cassandra needs you to hold on to the Gale Gourd for 30 minutes. Help a girl out, yea? Reward: 2 to 4 Tempest Coins. Requires: Lv. 60 – 94 or 135 – 200. Talk to Spiegelmann or click the Tempest event notifier on the left-hand side of the game window to accept this quest. Complete any of the Monster Park dungeons 3 times in a day. Reward: Tempest Coin Pouch – Contains 3 Tempest Coins; randomly a Chaos Scroll 60% or an Advanced Awakening Stamp. Talk to Maple Administrator or click the Tempest event notifier on the left-hand side of the game window to accept this quest. Survive 15 Pyramid Dunes rounds of any difficulty in Nett’s Pyramid outside of Ariant. If the player foreits a round, then none of the rounds count towards the completion of the event. Requires: Lv. 50 – 120. Progress through all four seasons of the Gonzo Gallery to relive Spiegelmann’s adventures! Requires: Lv. 50 or above. Complete any Party Quest three times a day. Different snowboards have a chance of dropping from different regions. All snowboards are pole arms and usable by any class. Sky Snowboard: REQ LVL 0, Attack Speed: Normal, Weapon ATT: 18. 7 upgrade slots (unhammered). Obtainable from the following regions. Nautilus, Edelstein, Ellinia, Kerning City, Perion, Henesys. Aqua Snowboard: REQ LVL 0, Attack Speed: Normal, Weapon ATT: 18. 7 upgrade slots (unhammered). Silver Snowboard: REQ LVL 24, Attack Speed: Normal, Weapon ATT: 42. 7 upgrade slots (unhammered). Obtainable from the following regions. Mushroom Castle, Edelstein, Ellinia, Orbis, Kerning City, Perion, Henesys. Gold Snowboard: REQ LVL 36, Attack Speed: Normal, Weapon ATT: 54. 7 upgrade slots (unhammered). Obtainable from the following regions. Ludibrium, El Nath, Orbis, Kerning Square, Perion. Dark Snowboard: REQ LVL 48, Attack Speed: Normal, Weapon ATT: 66. 7 upgrade slots (unhammered). Obtainable from the following regions. Ludibrium, Magatia, Mu Lung, Sleepywood, Korean Folk Town, Ariant, Aquarium, Edelstein, Omega Sector, Chryse. Maple Snowboard: REQ LVL 70, Attack Speed: Normal, Weapon ATT: 85, 7 upgrade slots (unhammered). Obtainable from the following regions. Neo City, Leafre, Magatia, Mu Lung, Gate to the Future, Herb Town, The Lion King’s Castle, Temple of Time, Clocktower bottom floor, Aquarium, Edelstein, Ellin Forest, Dimensional Schism, Dead Mine.